Face lifting has evolved from simple tightening of the facial skin to the realisation that working on the deeper structures of the face and restoration of volume is necessary for a long-lasting result. The windswept look of over tightening skin is a thing of the past with modern techniques and a skilled surgeon. Whilst lines and wrinkles are the obvious signs of ageing, the key effects are loss of fat, loosening of supporting structures and changes to the facial skeleton. As part of the aging process our skin progressively loses its elasticity and our facial muscles tend to slacken. The rate at which this happens varies from one person to another and is probably determined by our genes. Substantial weight loss, smoking and excessive sun exposure can accelerate the process. As a result the folds and smile lines deepen, the corners of the mouth droop, the jaw line may sag, creating jowls allowing fat and folds of skin to gather around the neck. There are several operations that can be carried out to reduce some of the more visible signs of ageing. What can and should be done during your facial surgery will be determined by your particular concerns and requests and the anatomy of your face. Under the skin of the face there is a layer of muscles and fibrous tissue known as the superficial muscular aponeurotic system (SMAS). Tightening the SMAS lifts the features of the face without needing to stretch the skin excessively. The SMAS can be tightened by a number of different ways depending on your face, your surgeon’s preference and the length of downtime that you are willing to accept. Gathers folds of loose SMAS along a line and stitches these folds together to tighten. The direction of tightening can be purely upwards (vertical plication), or upwards and outwards. (Minimal Access Cranial Suspension lift) is a SMAS plication method with a unique way of tightening that uses two to three loops of stitch to draw up the SMAS in the cheek hollow and in front of the ear, in upward and outward directions. Involves cutting out a strip of loose SMAS and stitching the cut edges together to tighten it. This is an alternative to gathering up and stitching the loose SMAS as with the SMAS plication or the MACS lift. Involves lifting the SMAS off the cheekbone area, where it is tethered down because some surgeons believe that the SMAS needs to be freed up more to achieve better lifting of the face. Other, less commonly performed techniques go even deeper, such as the Composite Lift and the Subperiostal Lift. For those with sunken cheeks, a mid-facelift involves lifting the fat and muscles off the cheekbone to create fullness and facial definition. All of these techniques are capable of producing excellent results in face lifting, it is often not about the technique itself, but more about selecting the technique that is right for you and your face. The aim of surgery is to rejuvenate your face, giving you a refreshed, natural look and avoiding a pulled or tight appearance. A facelift and necklift are usually performed under general anaesthesia with an overnight stay in hospital. The procedure is performed through incisions that go in front of the ear, round the earlobe and upwards behind the ear. The tightening of the muscles and skin of the face and neck is performed through these incisions. These incisions usually heal to form fine scars that are well concealed. Short scar techniques can reduce the extent of these scars, but may limit what can be done due to the reduced access. Gentle liposuction may also be used during the operation, to enhance the jawline and neckline, this may involve an incision under the chin. Both men and women choose to undergo facial surgery. If your face and neck have begun to show the effects of ageing but your skin still has some elasticity and your bone structure is well defined, a facelift may be right for you. Most patients are aged between 40 and 65, but facelifts can be performed successfully on people beyond this age. A facelift cannot address wrinkles on the brow, frown lines or puffy, tired looking eyelids. The surgery can be combined with a browlift or blepharoplasty (eyelid surgery) to address these areas. Complications are RARE, but you should be aware of them so that you can make an informed decision about your surgery. Every operation carries with it the risk of bleeding, infection and delayed healing. Significant bleeding may require urgent reoperation. Delayed healing may require treatment with antibiotics and regular dressings and may result in more obvious scars. There may be skin irregularities or asymmetry. There may be damage to the nerve that supplies sensation to your ears, or even damage to the facial nerve. This is the nerve of facial expression that allows you to raise your eyebrows, close your eyes, smile and sulk. I emphasise that this is rare. As mentioned above, the scars heal very well in most patients, but please be aware that if you have dark skin, freckly skin or red hair, the scars may be more obvious or even lumpy. Hypertrophic scars can be improved with appropriate treatment. Rarely, there may be reduced hair growth around the scars. What should I expect following surgery? After the operation, a padded bandage is placed around your face and neck, which helps to reduce swelling. There will also be small plastic tubes to drain away any excess blood or fluid from under the skin. The day after the operation, the dressings and drains are removed and your hair will be washed before you go home. The recovery period overall is 3 weeks. There will be bruising and swelling, most of which will subside by the end of the first week and prescribed oral painkillers will help to control any discomfort. There will be some numbness of the skin of the face and neck that will gradually resolve over the next few weeks. Most of the discomfort subsides by the end of the first week and you should be able to venture out of doors by the end of the second week. You will be able to return to normal activity by the end of the third week. However, you should avoid driving until you are confident you can perform all necessary manoeuvres safely. Our practice nurse will be in close contact by telephone whilst you are recovering at home and you can contact us as often as you wish. You will usually be seen in the clinic one week and then one month post treatment. 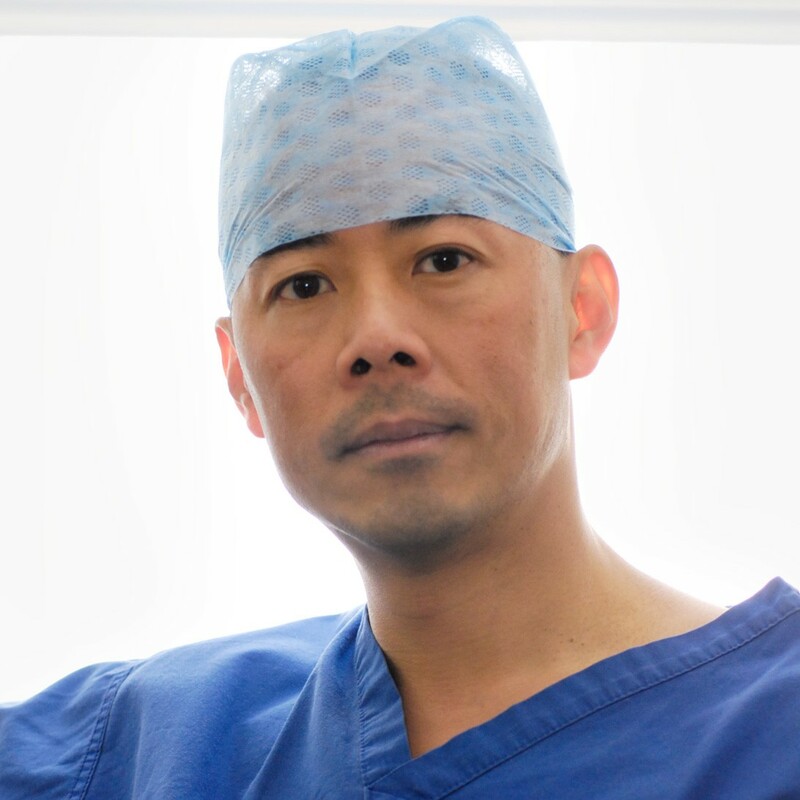 In the longer term, you are welcome to see Mr Ng for a checkup at any time and all follow up appointments are free of charge whether they be at 1 month or even 10 years post operatively.